Week 46. You’re kidding me, right? 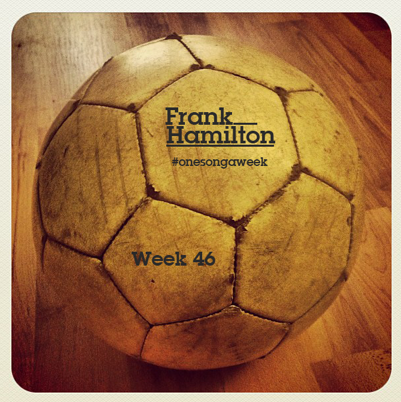 I can’t believe we’re in November, which is shaping up to be one of the most exciting months in #onesongaweek history. It started with chickens and politicians (Week 44 – Animal Farm w/ Mark Grist) and progressed to duets and houses (Week 45 – Flaws & Ceilings w/ Lauren Aquilina)… and now we’re moving on to football. Before we put our shin-pads on I wanted to give you a heads up that next weeks song will be called ‘Wet Shoes’ and was written with Ed Sheeran. If you’d have told me that 46 weeks ago (when I started out with a case full of ideas and a bin-bag full of nerves) I’d have told you that it wasn’t possible and insisted you get your head examined. Needless to say I’d have been very, very wrong! Monday: Finished writing and demo’d this weeks song. ‘Football’. Tuesday: Woke up early to record, comp and mix Lauren’s vocals on week 45. Wednesday: Started recording week 46. A rapper and his manager heard it and wanted to get involved. Friday: Eventually decided against holding back the song (didn’t want to make you lot wait until Tuesday again). I halfed the rap section and put a guitar in there instead. This weeks song is kind of about football and kind of not. The choruses is like Ronseal (does exactly what it says on the tin) but the verses chat more about the human condition (using football terminology). I wrote it in the middle of the night and it was one of those songs which just falls out without any real effort. It’s nice when that happens. “I can run… run away from anything”.